Only partial results available. Stanley's column in the Manchester Weekly Express and Guardian (which in 1862 became the Manchester Weekly Express and Review) announces the first round pairings (26 Oct. 1861) and gives the first round results (18 Jan. 1862), apart from the unfinished Kyllman-Hamel match, and some of the second round pairings. No further information appears, aside from a second round win by Kipping over King, and a comment on 22 Mar. 1862 that no further progress had been made. 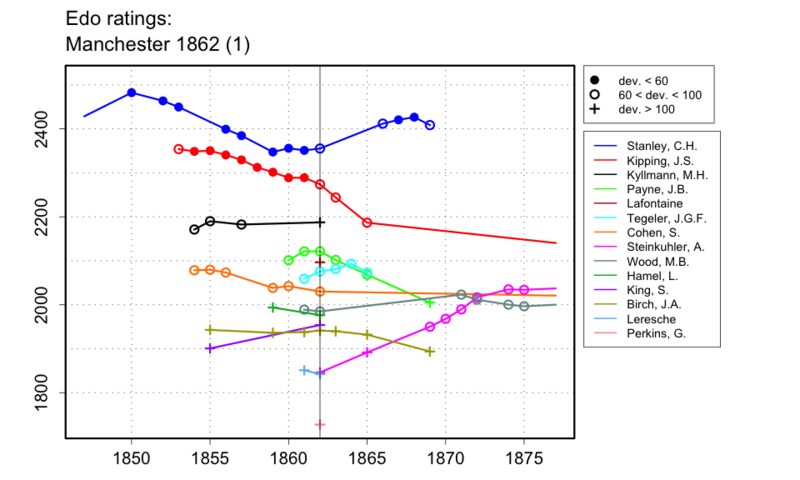 The Era of 2 Feb. 1862 gives the same first round results. I give the start date as Oct. 1861 since that is when the pairings were announced, but when the games actually started is not clear. I give the end date as Jan. 1862 since that is the date of the last results I have. Whether or when the tournament was completed, I do not know.